The Microtech Tachyon III, sets itself apart from previous models with milled, one-piece channel construction handles, a spring latch, and a standard pocket clip. The Bohler M390 bronze finish steel blade showcases a non-sharpened swedge-ground tip and milled grooves with the Microtech logo, production date, and blade steel markings up front. The Tachyon III exceeds all expectations with an advanced ceramic ball-bearing pivot assembly that eliminates handle play and produces superb flipping action. The pivots utilize Viton o-rings for load dampening, and heat treated stainless steel retainer plates ensure long-lasting performance. 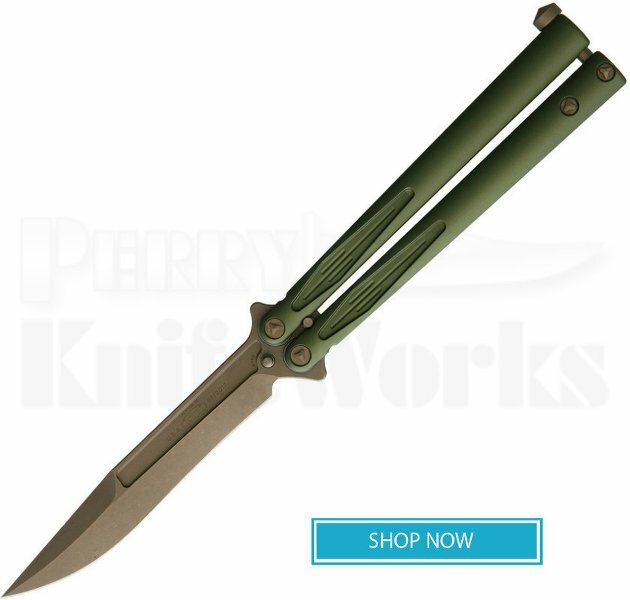 This Tachyon III model has a bronze finished M390 steel clip point blade and durable type III od-green anodized handles. Adjustment tool included.